Book it! Maui Sunset 409A Recent remodel with full kitchen and ocean view! One bedroom, two bath ocean view fourth floor condo. June 2014, remodeled kitchen with granite counter tops, new cabinets, fixtures and beautiful tile thru out living room and bedroom, very tastefully done! Good walking, windsurfing, kite surfing beach fronts this oceanfront condo complex in North Kihei. 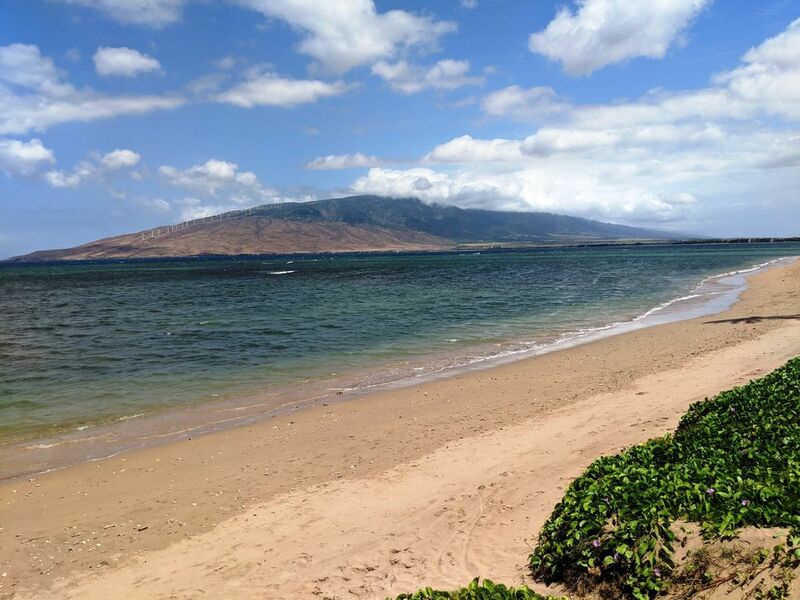 A couple of minutes away from Kamaole Beach I, one of the great beaches on the sunny South shore. Air conditioning in living room and bedroom. Condo has a queen bed, daybed and a sofa sleeper, and complimentary high speed internet + WIFI. My friends and I stayed here for a few days and it was perfect for us! Great location right on the beach and walking distance to stores and shops! We even got food from the local grocery store and cooked a couple meals at the condo to save some money. Super easy since they had all the supplies we needed. Everyone we met was super friendly, helpful and welcoming! Would definitely recommend staying here! We love Maui and have stayed many times at a variety of condos and this was by far the worst!!! Very dated. The bathrooms were awful. The bedding and the towels looked like they’d been bought at a garage sale. 409b needs a Lot of work to make it an acceptable vacation rental. Our trip was good. The unit was nice but not as good as the one we have used for a number of years. It was very well kept but there was little room to put things. Great value! Excellent pool! Beach is more for walking. Grounds immaculate!! A one minute walk to the beach for fabulous sunsets! Thank You for your review of the Maui Sunset unit 409A. The staff of Kumulani Vacations is very glad to know that you enjoyed your stay at the property. It was perfect weather. A nice change. Thank you for your review of Maui Sunset unit 409A-We look forward to assisting you for your next winter getaway to Maui. We've been staying at the Maui Sunset since the late 80's. First were our parents,then us, now our children and soon their little ones. That says a lot about a place when you have had three generations returning year after year! Can't say enough nice things about the Sunset. Much appreciation to Wendy at Kumulani. Thank You for the very nice review of the Maui Sunset. We appreciate your loyal support of Kumulani and Maui Sunset and look forward to your next vist with your family.